Is Performance Management just another HR process or does it help your leaders grow and inspire their teams? Review your approach with this quick assessment. Click below and use the sliders to select where your organization falls on the continuum. Along with your results you’ll receive a 2016 Performance Management study by the Brandon Hall Group. How often do your leaders have 1-on-1 performance discussions with their team members? How strong are your leaders’ skills to coach and develop their teams? How do leaders view performance management? What performance are your leaders tracking or managing? 57% of organizations have made no changes to performance management in the last two years. How much change are you planning? Almost done! Complete this short form to view your results and access the paper Talent Review and High-Potential Identification: Overcoming Five Common Challenges. Almost done! 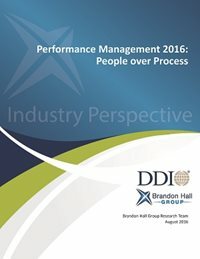 Complete this short form to view your results and access the paper Performance Management 2016: People Over Process. Along with your quiz results you'll also receive research findings and 6 critical calls for change in this study from the Brandon Hall Group.